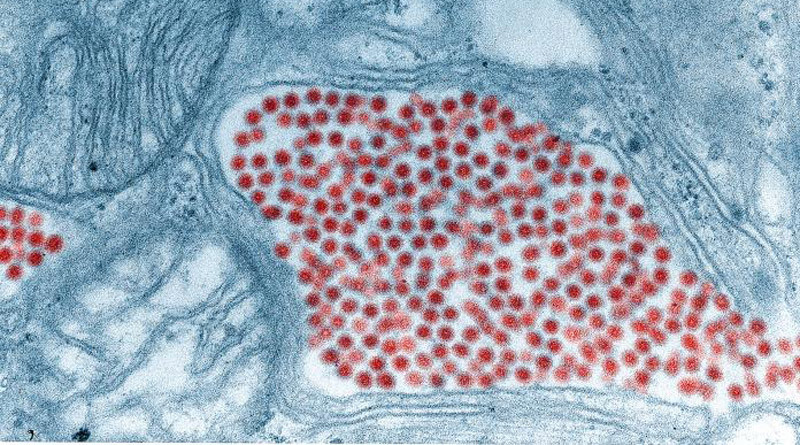 Genetic analysis of blood meals has helped narrow the field in identifying mosquito species with a potential role in infecting horses and humans with Eastern Equine Encephalitis virus (EEEV). EEEV is a highly pathogenic mosquito-borne arbovirus, with active transmission centered in freshwater hardwood swamps in eastern North America. Local transmission is maintained through the mosquito Culiseta melanura feeding on the blood of local birds. Researchers from the Connecticut Agricultural Experiment Station noted that the roles of other locally abundant mosquito species in virus transmission were largely unknown. Learning more, they pointed out, would potentially clarify transmission dynamics of the virus. The disease, which is also found in Central and South America and the Caribbean, was first recognized in Massachusetts in 1831 when 75 horses died of viral encephalitis. The virus is especially dangerous in horses, with neurological problems resulting in a mortality rate of 70% to 90%. The study team, John Shepard, Theodore Andreadis, Michael Thomas and Goudarz Molaei, collected blood-engorged mosquitoes at four established freshwater EEEV hotspots in Connecticut. The mosquitoes were identified by species. The researchers then genetically tested the blood meals consumed by the mosquitoes to determine the animals on which they had been feeding. The study team, writing in the journal Parasites & Vectors, said 12 mosquito species were identified. The researchers managed to identify the vertebrate hosts of 378 specimens, representing 50.3% of the engorged mosquitoes. Culiseta morsitans, Culex restuans, and Culex pipiens acquired blood meals exclusively from bird hosts, they reported, whereas Aedes cinereus, Aedes canadensis and Aedes stimulans obtained blood meals solely from mammals. Species that fed opportunistically on both birds and mammals included Aedes thibaulti and Anopheles punctipennis, Anopheles quadrimaculatus, Coquillettidia perturbans and Aedes abserratus. Culex territans obtained blood meals from avian and amphibian hosts. Mixed blood meals originating from both birds and mammals were identified in Anopheles quadrimaculatus and Culex territans. “Our findings indicate that wood thrush, tufted titmouse, and a few other avian species serve as hosts for mosquitoes, and likely contribute to amplification of EEEV,” they reported. They said their study supported the role of Culiseta morsitans in local transmission of EEEV among bird species. “Culex territans will seek blood from multiple vertebrate classes, suggesting that this species may contribute to epizootic transmission of the virus. They said the contribution of white-tailed deer to the dynamics of EEEV transmission was not fully understood, but the findings indicated repeated exposure due to frequent feeding by vector competent mosquito species. John J. Shepard, Theodore G. Andreadis, Michael C. Thomas and Goudarz Molaei.